Some of you might think “hair rollers are for old ladies!” but it is slowly gaining popularity again! There are a lot of kinds of hair rollers like the velcro type, sponge type, rollers for bangs, that can be a little confusing to choose. We will show you the products that are available online, and introduce the top 10 items in rank order. 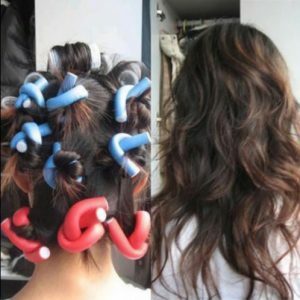 We will also show you the proper way to use hair rollers, so keep reading! Hair roller, is a beauty item used to make curls. The biggest pro of hair rollers is that it does not use heat and electricity like hair irons or curlers, making it easier to use wherever you may be. You can even use it when you want to retouch your hair curls while you’re outside. Not to mention that it won’t damage your hair because you are not using heat. How great is it that you can make curls without damaging your hair? You can make luscious curls with hair rollers and there are a lot of kinds of them. Check this out if you don’t know the best type for you! Keep the following pointers in mind so you know which product matches your hair length and which product to choose. If you try to use hair rollers on long hair, the hair rollers might fall off because of the hair’s weight. That is when “hair rollers with clip” comes in handy. The clip will make sure the hair roller won’t fall off and keep them in their place while making beautiful luscious curls. There are a lot of people who use hair rollers while they are asleep. You just need to remove them in the morning, and you are good to go. The normal hair roller is made with hard materials, that can hurt if you put it on before you go to bed. 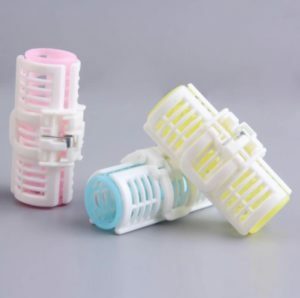 “Sponge type hair rollers” are soft and won’t hurt your head, while making sure they stay in place, so they’re perfect for those who want to use hair rollers while sleeping. Your hair thickness or strand quality won’t matter, making it a very popular product. 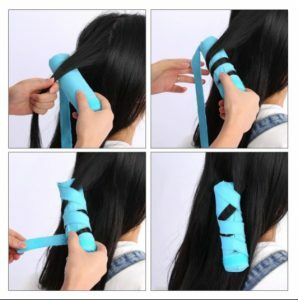 If you want to curl your bangs, then “velcro hair roller” is the best one for you. You may burn yourself if you use hair iron or curler, but you won’t have that problem with velcro hair rollers. The surface is rough like velcro, and your hair will stick to the surface easily. Your bangs have lesser hair than other parts of your head, but the velcro hair roller will still make it possible to stick to your hair. It is very easy to remove too. There are also a lot of sizes you can choose from to achieve the look that you want. If you want loose waves for your long bangs, choose a thicker hair roller. For those with stubborn wavy hair, choose a thinner velcro hair roller. Hair rollers can be used repeatedly and can be used for a long time, but you need to keep it clean. 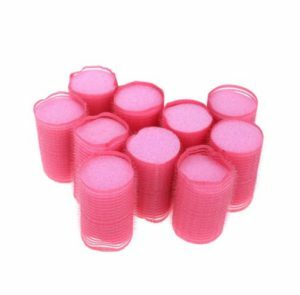 Plastic hair rollers can be easily washed with water. It may not be suitable for those who want to use them while asleep, but is perfect for those who want to make sure their hair rollers are clean. Now we move on to the popular hair rollers in rank order. They are all good at making great curls, but keep in mind the above pointers to find the best one for you. 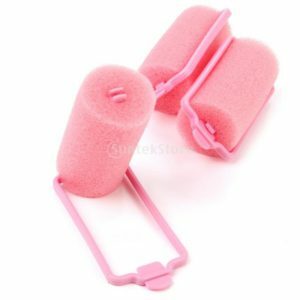 This sponge hair roller is one of the easiest to use. If you’re used to it, you only need 15 minutes to put all your hair in this. All parts are made of sponge, so sleeping while wearing them is not a problem at all. One problem with it is it can’t hold on to too much hair and tend to fall off. Definitely not suitable for those with voluminous hair. Though if you have thin hair, it can be easier for you to use this than regularly shaped rollers. 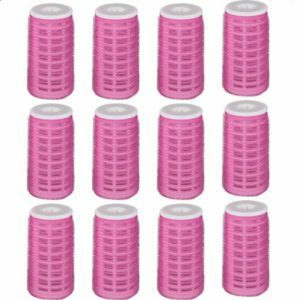 As mentioned previously in our “Buying Guide”, the best thing about plastic hair rollers is that it can be washed and it is easy to maintain. Another best thing about this roller is when you blow dry your hair, the heat will go through the rollers and can shorten the time needed to dry and style your hair completely. Highly recommended for hair and makeup artists, as the cleanliness of their beauty tools is a very important factor for keeping their clients. Shorter styling time will be a great help for hair and makeup artists too! This product has its priority on “comfortable sleep”. 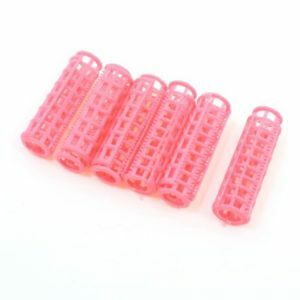 Some sponge rollers are good for sleeping, but has tiny plastic parts that can be a little annoying. Not with this one! 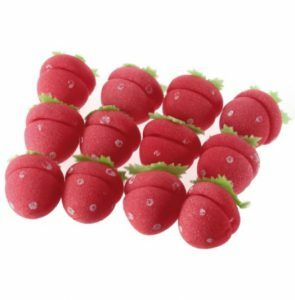 They are super soft and can be flattened when you lay down on them. They won’t get in the way of your good night sleep. The bad thing about it though is, since it is velcro roller too, it can easily fall off. We highly recommend this if you don’t move around too much while you sleep. These rollers are big enough to create waves at the end of your long hair, to create the mermaid hair effect, or can be used to give volume to your bangs. The best part is, you can run around and these rollers will stay in place. Highly recommended for busy moms who tend to move around a lot in the morning, preparing your kids, your work stuff, etc. You won’t need to worry about rollers falling off when using this product. Though the price is a bit too high for 3 pieces of hair rollers but definitely worth a try. 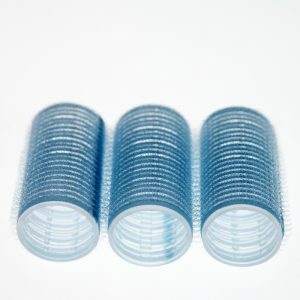 This velcro hair roller can be used on wet or dry hair. The most recommended way to use it is to use it on a wet hair, apply hair blower, let the air flow through its vented slots, and create the curls very quickly. It sticks to your hair perfectly and stays in place to give you the beautiful curls you are looking for. Highly recommended to those who can’t stand not shampooing in the morning, as the vents will help you shorten your drying time. Get those Beach Waves with This! These rollers are very easy to use and click on to stay right in place. 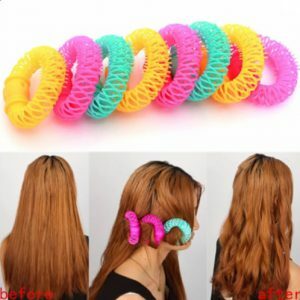 They are made of soft plastic, and if your hair is long enough, you can even wear them while you are sleeping. Even if you move around a lot while you’re asleep, these won’t fall off your hair. One bad side is it can only be used with girls with long hair. If you decide to cut your hair shorter, you might not be able to use them anymore. You can’t use it on your bangs too, so their function is limited. Some of you may have experienced going to your friend’s house for a slumber party or meeting up at a friend’s house to dress up for an event together. These hair rollers will definitely add more fun! It works just like the regular sponge rollers, you can also sleep while you have them on your hair. They are just a hundred times cuter than regular sponge rollers. Can be a great gift for your kikay friends too! Keep in mind though that you would need the regular rollers if you want volume on your bangs, aside from that, it can do pretty much anything a regular looking roller can do. Hair rollers tend to take up space, especially the ones with a bigger diameter. If you are traveling to attend an event or a party, bulky luggage is never a good idea. 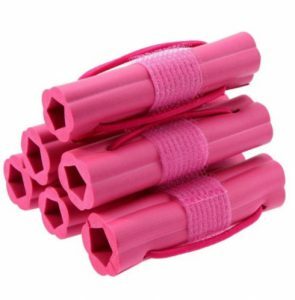 You can keep your luggage compact with this hair curler because they just look like sponge sticks when not in use. Highly recommended for hair and makeup artists who need to bring A LOT of tools and makeups during gigs, to help lessen your stuff even for a little. Beginners might have a hard time using them, especially at the back of their head where vision is limited. 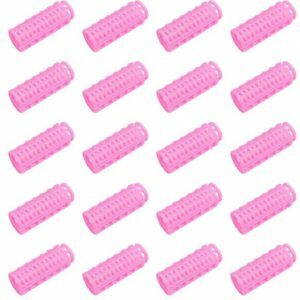 Some sponge rollers have tiny plastic pieces that hurt when you try to sleep with them. Not this one! It uses rubber bands to make sure they stay in your hair while they work on your hair to create beautiful curls. It can be a little hard to use for beginners, but a little practice is all it takes. Highly recommended for those with voluminous hair, since the rubber band will sure to keep that hair. These rollers are not just made of any sponge, but they are made with MEMORY FOAM. The best foam is known to give you the best sleep ever. It has a garter/magic tape attached to it to make sure it won’t fall off while you sleep. Don’t worry, even if you move a lot while you sleep, these rollers won’t fall off or won’t hurt you in any way possible. You can also use it on your bangs, though it may be a little too big and can be a bit annoying if you have it on your forehead. It is easy to make beautiful curls with hair rollers, but sometimes they fall off way too quickly or can be hard to put on and many just give up. You just need to know the technique! Practicing and mastering them will help you shorten the time you spend on your hair in the morning, so read on! One of the techniques in putting on hair rollers efficiently starts with grouping your hair. This can greatly affect how the finished product looks like. For beginners, the easiest is to group your hair into 4 parts: 2 sides and 2 backs. When you are a bit used to putting on hair rollers, divide the 4 into an upper part and lower part, make it 6 parts, 8 parts, and the more groups you make, the more beautiful your curls will become. 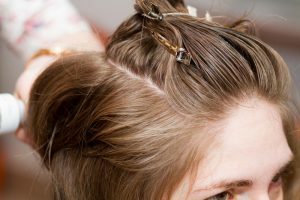 Hold one group of the hair, place the hair roller at the root, slide it to the tip (this will prevent any hair remains), and roll the rollers up while holding onto the tip of your hair. When rolled up until the roots, keep it there until your hair becomes curly. If you want to get the curl faster, apply hot air and cold air alternately. 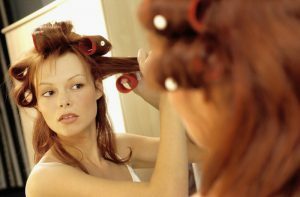 When removing the hair rollers, be careful not to destroy the beautiful curls you just created. After removing all hair rollers, just comb your hair with your fingers until you achieve the look that you want. Next, spray some curl keeping spray on your hair, and you’re good to go! How was it? You will be able to make beautiful curls once you get the hang of it. You can curl your hair wherever you are with hair rollers, even without electricity. Products we showed you today will help you achieve the beautiful luscious curls, even while you sleep! Please do try them out!